Ailing ZX Spectrum Vega firm Retro Computers Ltd appears to have lost one of its key people, amid a battle of words between the MD and a former contractor. Lee Fogarty, who until recently was a contractor for RCL and organised the company’s webhosting, appears to have parted ways with the firm and now seems determined to cast doubt on whether RCL’s Vega+ handheld console will ever be delivered. As regular readers know, RCL promised more than a year ago to manufacture a portable gaming console closely modelled on the classic ZX Spectrum, Sir Clive Sinclair’s brainchild. Since taking £513,000 from the public in the form of crowdfunded donations, RCL has simply hung onto the cash, delivered nothing, and engaged in needlessly cash-burning lawsuits against former directors and sales agents alike. Fogarty alleged on Facebook that police had become involved as a result of RCL MD Suzanne Martin calling them in. It appears that when Fogarty departed the company he disabled its website, allegedly over unpaid hosting fees or similar, which prompted Martin to ring the plod. 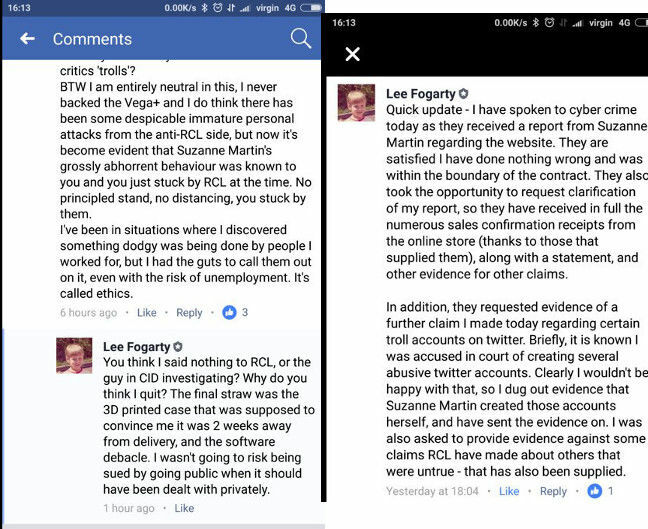 Fogarty then alleged on Facebook that Martin was behind certain pseudonymous Twitter and Indiegogo accounts which had been "trolling" RCL's backers (i.e. customers). Who is trolling whom and why are they calling it trolling? A number of commenters on the lengthy Indiegogo comments section under RCL's page appeared to hurl abuse and derision at genuine customers asking for refunds on their products. In addition, weird things have been happening on Twitter – particularly if one browses through the hashtag #ZXVega. Some Twitter accounts were being used to post what purported to be elements of RCL's detailed financial statements, as well as hurling abuse hither and thither. All this abusive behaviour appears to be what RCL categorises as "trolling", which any fule kno is not what the term actually means. A November 2016 court action brought against RCL by former shareholders Paul Andrews and Chris Smith to stop Levy from unilaterally taking over their combined 50 per cent shareholding also contained, at the outset, a legal attempt to stop Fogarty from abusing Andrews and Smith. That motion was dropped early on in the case, which was otherwise successful. Talking to El Reg, Fogarty denied "trolling", publishing private or identifying information about individuals (doxxing), and setting up fake accounts. The C64 that Martin refers to is another retro-themed gaming product being made and delivered by Paul Andrews, as an entirely separate venture. Why should world+dog give a monkey’s? It has repeatedly failed to meet its own self-imposed deadlines, despite renewing them over and over. The last one sailed past without a murmur in October. If Fogarty, who was one of RCL’s key players, has now thrown in the towel, the prospect of the Vega+ ever being delivered has now shrunk even further. Given that more than 4,000 people stumped up for the Vega+, it is time that the proper authorities began looking into RCL’s business practices. Not to look into the he-said-she-said sniping that has been a hallmark of this saga, but a proper investigation into the actions of the company’s directors. If they don’t intend to deliver, the authorities ought to look at what measures can be taken to fully reimburse those who gave money in good faith for a home entertainment product.